The minibus dropped us off in Carlisle, right outside the Castle. Our leader, Patience, pointed out some of the sights of the city to us as we passed through. We were particularly taken by the ‘Bishop’s cursing stone’ where the names of border reivers (basically cattle thieves) that had been ceremoniously cursed by the bishop were inscribed (if anything unfortunate happened to us on the rest of the walk, someone would always suggest we’d been cursed by the bishop!). We had a quick look inside the Cathedral - the people there were very nice about it, as there was a service due to start in 15 minutes. 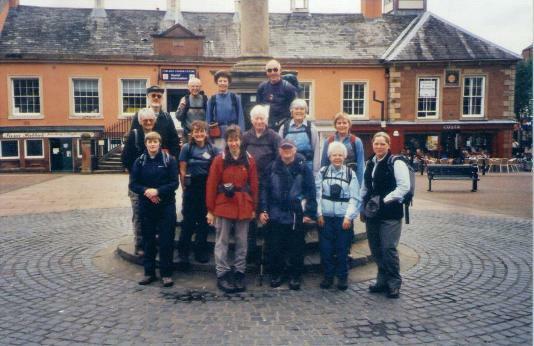 We then went to the Carlisle Cross in the Green Market, the official end (or in our case start) of the Cumbria Way. After the obligatory photo shoot, we set off on our walk to Ulverston. It didn’t take us too long to get out of Carlisle, and we were soon heading south, walking alongside the river Caldew. This was a well-used route, part of it a cycle way. We stopped for our morning break by a metal bridge over the river, where I saw a Dipper. We then continued on, still following the river. The skies had been grey all morning, and we were soon stopping to don our waterproofs as the forecast rain put in its first appearance of the day. It had stopped by the time we reached Dalston, where we stopped and had our lunch by a children’s playground. Shortly after we left Dalston, the rain returned and continued for most of the afternoon until we had almost reached our day’s destination of Sebergham. The afternoon was consequently a very wet and damp affair, as we pressed on through very rural surroundings, almost constantly in the company of the river. We passed through a long succession of fields, some arable, some with sheep or cows in, and one containing a bull (too busy with its herd of cows to be interested in us). At one point we passed close to Rose Castle, the official residence of the Bishops of Carlisle for around 700 years. Of course, the rain was blamed on the Bishop cursing us! Eventually, we arrived at Sebergham church, probably looking like a pack of drowned rats, although the rain had just stopped by this point. The organist was inside the church practising for the evening service. After a short break, we concluded the day’s journey with a simple stroll to where the minibus was waiting to pick us up by the bridge in Sebergham.